Everyone has that one great idea at one point in life. Envisioning a product for the future is one of the best things you can do with your daydreaming time, but the real challenge is getting it done. For a product that hopes to change the world, you might have to consider creating your own startup. We hear about startups in the news all the time. In fact, they are mentioned so often these days that it seems everyone’s doing it. But in reality only a handful of entrepreneurs go through the motions like they’re supposed to. For instance, did you know that writing down every detail as it hits your head can turn out to be crucial for the success of the product? How about re-launching more than once? These practices, as well as many others, are vital to building a successful institution that can generate retention and revenue. It’s important to stress that some of these basic rules don’t apply to any kind of idea. For instance, showing your prototype to 100 people may or may not be recommended if your product can be easily replicated. Someone who is well connected and has access to bigger funds could deliver it to consumers faster than you. The same goes for a 50/50 equity plan – it may be too generous for one party, leaving too little for the other. The infographic below was created by information designer Anna Vital. 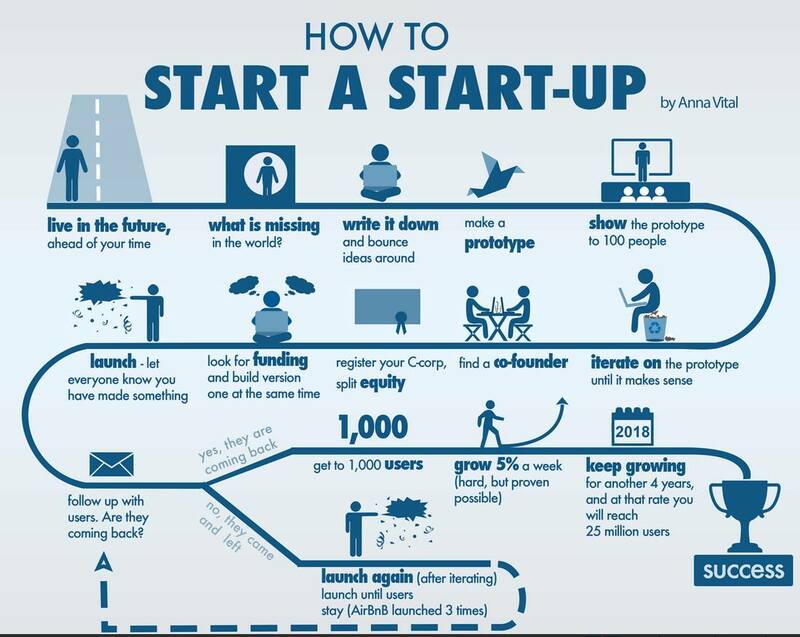 Based on a lengthier essay by Paul Graham, How to Start a Startup outlines the most important steps in creating a successful business poised to touch tens of millions of users. If that’s your dream, then don’t waste another second and delve right into it. The original essay admittedly pretty old, but Anna’s own interpretation of the paper is very much up to speed. So, do you have an idea for a company?